Is this the world's greatest chicken sandwich? It's been seen at some of Melbourne's swankiest luncheons, parties and events since 1962 – an astonishing 50 tonnes have left the Peter Rowland kitchen over the past 56 years. "While some food trends have come and gone, the chicken sandwich has stood the test of time and shows no signs of losing its popularity." 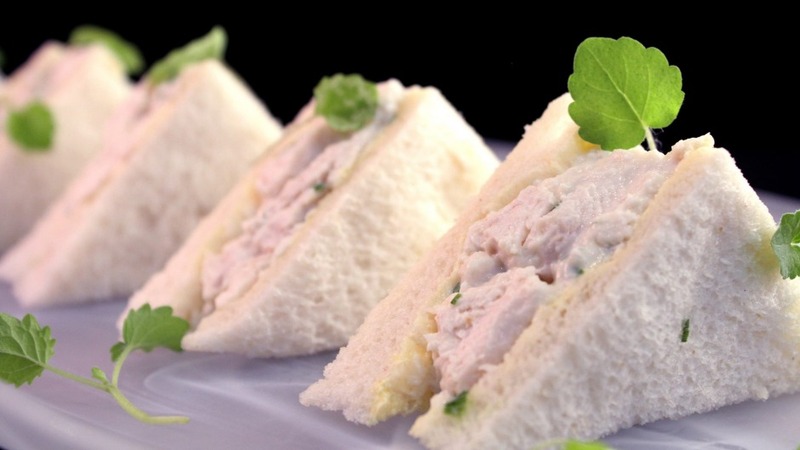 The company has launched Packed by Peter Rowland, an online corporate catering service that, with a day's notice, will deliver a box of 24 chicken sandwich points (quarter sandwiches). The exact recipe has remained a closely guarded secret. Until now. To make the mayonnaise, put the egg yolks, 1 tsp lemon juice or vinegar, 1 tsp mustard and a pinch of salt in a blender and blend for a few seconds. With the motor running, slowly drizzle in the oil and when it has all been incorporated, add 1 tbsp hot water and remaining lemon juice or wine vinegar and mustard. Season with salt and pepper. Make sure the eggs are at room temperature when you start. Add more mustard or lemon juice according to taste. Combine the chicken, mayonnaise and herbs in a bowl. Mix well and season with salt and pepper to taste. Butter the bread, trim the crusts. Spread the filling over six slices, top each with a buttered slice and cut into quarters.